H&M Capes first surfaced on Chictopia's streetstyle gallery in Winter 2011 seen on Los Angeles blogger shopLAcatrina of lacatrinadelamoda.com/. She wore her H&M poncho/cape cape with a H&M leggings and Faux fur collar scarf. 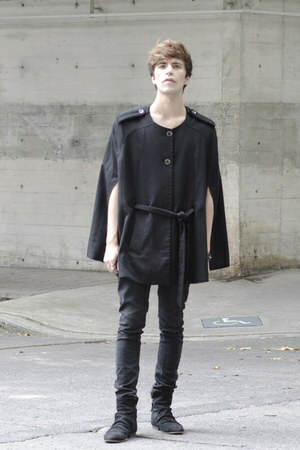 Since then, H&M Capes have grown in popularity as bloggers from Los Angeles, London, and Bucharest have discovered them. H&M Capes are generally seen in chic, bohemian, and casual style. Popular types of H&M Capes are plaid, wool, sheer, kimono, and poncho. Blogger's favorite colors are black, camel, brown, and heather gray. There are currently 234 streetstyle photos of bloggers wearing H&M Capes. Most recently, blogger ohhcouture of ohhcouture.com styled her ivory H&M cape with a sky blue Zara jeans, ivory Zara sweater, and ivory Zara bag.